I never heard of this until today, but there is a drink out there called Spribiscus. Isn’t that a great name? I think this is maybe a Southern thing. Or at least a Texas thing, because I found it listed on this menu for a café in Austin, TX. Makes sense, you need creative recipes for cool drinks in really hot weather. Anyway, you can probably guess what Spribiscus is made out of, just from the name. 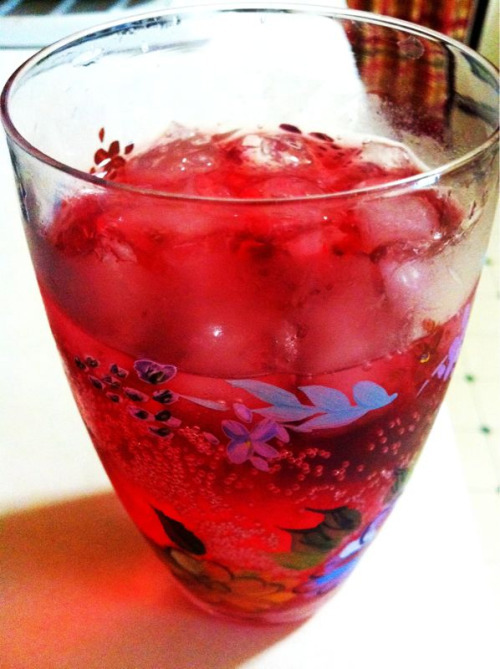 It’s hibiscus ice tea and Sprite, mixed together. I had to try this out for myself, so I bought some Sprite to test this recipe. I made my usual strong hibiscus tea from dried hibiscus flowers, let it steep, let it cool, then poured it into a glass I’d half-filled with Sprite and ice. Turns out Spribiscus is a really, really nice variation on basic iced hibiscus tea. You get the fruity, flowery taste of the hibiscus, combined with a refreshing hint of citrus and nice bubbles from the Sprite. As far as I’m concerned, Spribiscus is my new favorite summer drink.